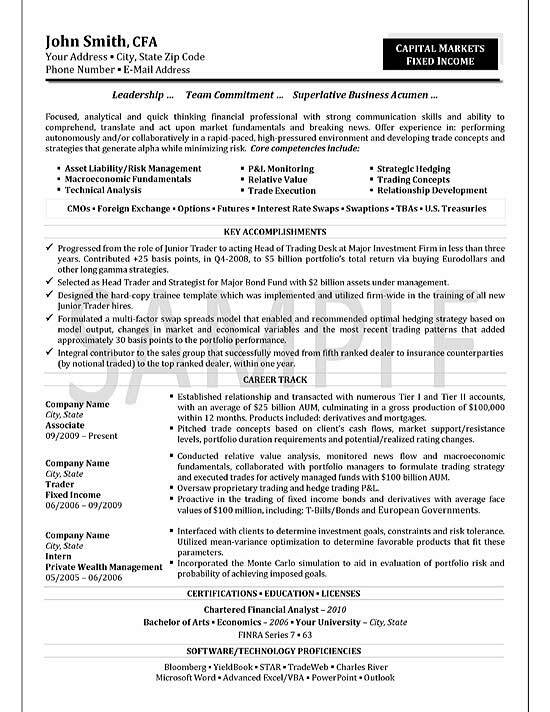 Resume example for financial professional with experience working as Head of Trading Desk for a major investment firm. This document would be a good reference for anyone in the financial markets or financial services industry. This job seeker possesses skills as a trader and financial analyst. This experience includes risk management, strategic hedging, market technical analysis, trade executing and trading concepts. The resume also emphasizes a strong understanding of various markets such as Forex, Options, Futures, Swaps, CMO’s, TBA’s and Treasuries. The candidate also demonstrates a successful career track, progressing from a junior trader to a head trader. The job seeker also became a top ranked dealer. This trader resume outlines specific accomplishments such as formulating a swap spread model and designing a trading template. The education section documents the job seeker’s Bachelor of Arts in Economics. Manage the negotiation and execution of investment trades on multiple exchanges covering foreign exchange, Commodities, stocks and fixed income. Implement corporate trading strategies and execute external client trading services. Trade a variety of investment vehicles including commodity futures, FOREX, equities, options and bonds. Develop products based on commodity trading vehicles and help sell those products to pension funds and institutional investors. Provide insight and support for software and systems teams in the development of algorithms, platforms and trading systems. Collaborate with management and trading teams to conceptualize goals, build strategic plans and implement processes to achieve targets. Work with sales teams to establish new accounts and provide world class customer service and brokerage support. Meet with customers to create client specific strategies to mitigate currency and commodity risks. Coordinate with compliance office to ensure that all data is transferred to regulators to meet requirements of Dodd-Frank. Monitor transaction costs and negotiate with brokers and exchanges to reduce expenses.